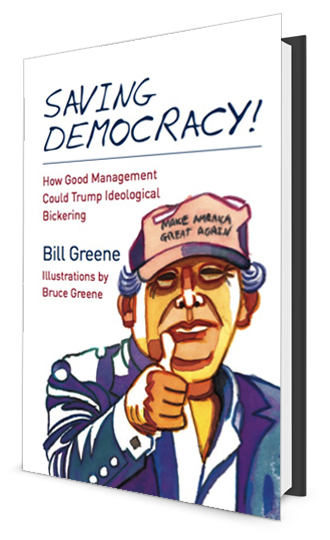 Get your copy of "Saving Democracy!" We are simply watching as our soldiers die in foreign lands, fighting wars we don’t understand, and the national debt spirals upward, while our leaders bicker over trans-gender bathrooms, play golf, and argue over who’s a “True Conservative.” There is a wake-up call: to not re-elect those who hide behind such nonsense! It’s up to the voters, Greene explains, to end the bickering and start making sound decisions; and above all, turn down the hot-button social issues that the politicians inflame to distract the voters. America’s future will not be determined by background checks for gun permits, or whether we tear down Civil War statues, or outlaw hate speech. On “Multiculturalism,” ── People, cultures, and religions are not equal— some are better than others, and some are plain awful! On “Diversity” ── Differences can be both good and bad. The best mix is one that’s all good! On “Leadership” ── America is not the world’s policeman, priest, or savior. World leadership comes from moral and economic example—not from drones, bombs, or lectures. Our worst enemies ── Not ISIS, Russia, or China—the worst enemies are right here at home. On “theocracies” ── It is no coincidence that there have never been successful democracies in theocratic cultures. Individual freedom and representative governments are unacceptable to a clerisy, which operates as a religion deisguised as a dictatorship. Readers will get a brief review of the history of democracies and the people that made them great. Greene explains why democracies can only work for self-reliant and moral populations. The people who built America were sustained by a unique cultural tradition founded on the principles of liberty, human dignity, and the Judeo-Christian religions. The author suggests that without the careful maintenance of that culture America’s future could resemble the dystopias of Huxley and Orwell—and how we have already started on those paths. America is known for business and free enterprise──many of the world’s greatest corporations are home-grown──and yet we elect amateurs to lead the nation. Very few of our presidents or legislators have ever brought real-world experience or management expertise to their government jobs. But their job is to run the federal bureaucracy—one of the largest “businesses” on earth! Greene points out that there is no damage that some common sense leadership and a little tinkering can’t fix. He details how, if the entitlement programs and the IRS were reorganized and managed efficiently, we could wipe out the deficit with the savings. Instead, the pols argue about theories, foreign affairs, and ideology. Part I – Are all People and Governments Equal? Part II – What is so Special about Human Beings? Part V – The Future – Where Are We Going ? ?